In SS2018, Albion is going to change the formula of Infinesse White. Infinesse White Whitening Milk IA to Whitening Pump Milk. I got some samples of new Infinesse White products. Please let me share the Whitening Pump Milk to other milk/ emulsions. Infinesse White Whitening Pump Milk has Vitamin C (L-Ascorbic Acid 2-Glucoside)as the brightening factor. Infinesse Line is targeted towards women in their 30s with the lifting function, and the Whitening Line has brightening and firming properties, with faster results, as Albion claims. As with other Albion milks, this one is meant to be used after face wash to bring back moisture to the skin. The texture is a little bit thick and milky, not too runny, as you can see from the swatch blow. It spreads and absorbs well on my skin too. After applying, my skin is moist, and well prepared for other treatments, as you want. I did not notice significant whitening after using this, which is understandable because I only used a sample—with skincare, it will take a few more applications to see results. I did not experience breakouts while using this one, even if this product has mineral oil. There are others who may want to take note, especially for those who are sensitive to that ingredient. Overall I feel that it is a good product to help retain moisture in the skin after washing. In this time, we do not have samples/ bottles of Infinesse White Whitening Milk IA, we can not compare with this new milk and the previous formula. The first comparison is with Excia AL Whitening ER Milk SV. In Excia Whitening line, they use Tranexamic acid as the brightening factor. Anyway, please let me compare these two milks. Whole of the package of Infinesse White, and 3 pushes of Excia. The texture of Infinesse White is more runnier than Excia White. Albion products are great quality, but sadly they always add stronger perfume. In person, I prefer Excia AL than Infinesse, but it is really up to people. Afterward of my using, I felt Whitening ER milk side is more moisturised, and thought the lifting function is almost the same. In Excia, Whitening Rich Milk SV is lighter than Whitening Extra Rich Milk SV. A whole package of Infinesse White, and 3 pushes for the Excia. 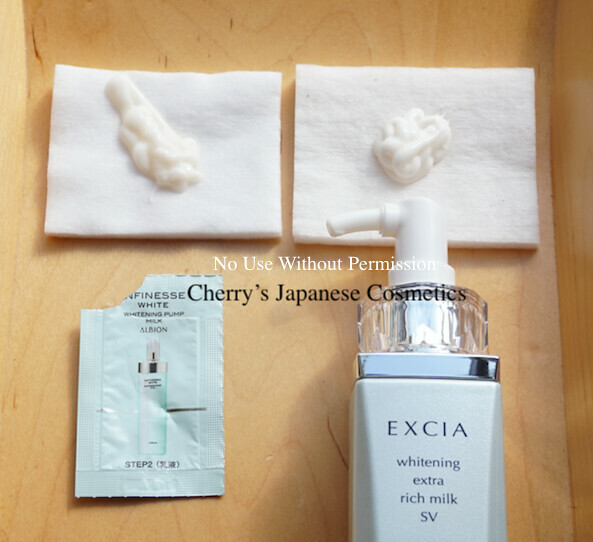 In Excia Whitening Rich Milk SV, I felt they are almost the same texture, the different perfume. My skin afterward, to be honest, I could not find much difference between those two products, both I felt super comfortable, enough moisturized by water and oil, and smooth. After one hour or less, I did not use neither lotion nor cream after these milks, I felt significant difference, Infinesse White side was smooth and less oily, Excia Rich Milk side was a little bit oily. Probably the moisturising level can be different, aka Excia is more moisturising, I suggest. If you feel Excia Whitening Rich Milk SV is too much for your using in Summer, one solution may be switch to this Infinnese White. And the lifting, I did not feel so much big difference between two milks, on that time. Of course I did not feel any stings, but if your skin is quite damaged, I do not recommend to use. For me, these are not pretty much oily, but it can be because my skin is combination to dry now. If you are an oil prone, Albion is not for you. Infinesse White is affordable price, but in person, I prefer Excia AL’s perfume. If you are a person who does not care about the perfume, and seems it was a person who asked me the difference between Infinesse White and Excia AL Whitening, she/ he is an Infinesse user, and satisfied with Infinesse, I do not think s/he does LOVE Excia AL. Infinesse Derma Pump Milk is for Autumn – Winter, and I felt its lifting function the most among Albion milks. Please also check my review for Infinesse Derma Pump Milk. I felt Infinesse Derma Pump Milk is more quicker to be“ smooth” than other “moisture” line. And Whitening Pump Milk, I did not feel so much big different. The almost the same speed to be smooth, and could not feel the difference of the lifting function. According to one of the BCs of Albion, she said the Whitening is lighter, but in person, the moisturising level is not big difference. I could not find any difference of the perfumes, but one of the BAs who I know, she said the perfume of Infinesse White brings her headache, but Infinesse is OK. Those things are really up to people. You may want to see comparison with VQ Milk. The texture of Infinesse is harder than VQ Milk. I am in love with the scent of Ignis products, what is much better than other lines/ brands under Albion. I felt both are almost the same speed of being smooth, almost the same oil level, I mean both are lighter (I never say this is not oily product). So, I am feeling you can choose due to the price (Infinesse is affordable), or scent (I like VQ in person). Both are for brightening product, and the ingredients of the brightening factor is Vitamin C.